Just when I thought that sales have plateaued, suddenly there is a marked upwards shift on the sales graph. Getting to my desk yesterday morning after slaving over the latest post of this daily Currencies Direct inspired column for your edification and delight dear reader, I was curious as to why a 10 euro note should have been placed on my desk. It turns out that it was for another sale of my book, The Valbonne Monologues, and with the total now at 138 I now feel 150 is not only possible but almost inevitable. It is almost as if I feel I am not talking to myself anymore. Perhaps the second print run should be called The Valbonne Dialogues? I was saying as much at lunch yesterday at Auberge Provençal in Valbonne with Matt Frost , the Cornish Tsunami and his long-suffering carer and wife Viv. It was during my very own monologue that I think that, in order to deflect me from further self-congratulatory crap, I was shown some pictures of a younger Tsunami. As I say, I am not certain for what reason these particular pictures were presented, but they clearly harped back to an earlier age where hair was worn in gay abandon. As the Tsunami remarked “in pursuit of the hirsute”. After a convivial but rather expensive lunch, mainly because that Nice Lady Decorator developed a taste for a nice but overpriced Provençal white, and I had adjourned for my customary siesta, I was awoken by a great deal of screeching, which for once was not down to the wild parakeets that have taken up residence in our garden. No, it was the result of an excited phone call, the contents of which I was to discover later, but was sufficient to rouse me from my pit. A sundowner was required to revive equanimity (which I am reliably informed has nothing to do with horses). It seems that a new recipe was the reason for all the noise and so, last night, dinner came in the form of “beer can chicken”. If you are eating your breakfast whilst reading this, please look away now as I am going to attempt an explanation. It seems that preparation of this dish involves first opening and disposing of half a can of beer, which is normally something I can deal with quite easily, but then things take a turn for the worse. I don’t want to go into the actual mechanics but it seems said semi depleted beer can is then inserted in the chicken, in much the way normal people would insert stuffing and…no. I am not exactly certain what follows but I can assure you it is not very edifying. Peachy Butterfield’s northern chicken farming gay friend, Oven Ready Eddy, will be wincing when he reads this. 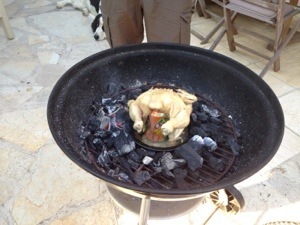 berbequed beer can chicken, lovely. A writer with a lower literary threshold and stronger Scottish antecedents than I, may have made some kind of joke here about this being a canny recipe, but you know I would never “coup” so low as to fill this daily missive (fricassee?) with jokes about chickens. It would be a foul outrage. Having given that particular subject the bird, let us move on. Tennis wars are due to recommence this evening at the Vignale, and I expect some sympathy from the Wingco and Blind Lemon Milsted in respect of the copy of my book which was thrown into the sea a few nights ago at Paloma Beach. They were both there to witness this assault on the literary world, and as they are both scholars of some repute, at least in their own minds, I deserve it but I shall not receive it. I have a feeling that the tennis post-mortem for the losers, which will not be I, will involve dinner out somewhere afterwards, and I for one will be avoiding chicken.